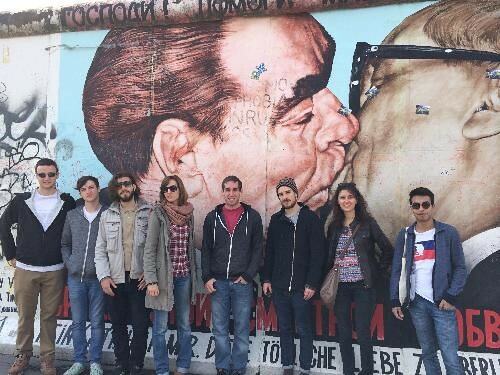 When I began planning my study abroad trip to Germany, one of the things I looked most forward to was meeting all new people and making new friends of a different culture. I mostly expected to be making all German friends while over here, which I would have been completely okay with. However, I soon found out that I was very wrong. Sure, I have made plenty of friends here that are native to Germany, but far more that are from all across Europe. Before coming here I did not realize how big of an international school Ruhr Universität was. In Europe they have what is called the Erasmus program, which is where a standard part of every students study is to spend 6-12 months at an international University. Because of this program I have been able to meet a far more diverse group of people that I ever imagined. So far I have met people from France, Italy, Turkey, Austria, England, Denmark, and Luxemburg. I’m sure that there are several other places, but that is all that comes to my mind at the moment. It is very convenient that since they all have different first languages, their mutual language is English, so I fit right in. Having connections from all over Europe is awesome for countless reasons. First off, I get to hear all of their life stories and see just how similar and different their cultures are. I also get to hear about some of the best places in each country so I know exactly where I want my next vacations to be and where to go while traveling. It is also very nice to know that I can travel all throughout Europe and have a few people that I know in each area that I can keep connections with and visit while I’m traveling. These are people that I plan on staying in touch with for a very long time and will help me feel at home every when I’m thousands of miles away from my home. Having the opportunity to meet people from all over the world really surpassed my expectations of this trip in a great way, giving me more experiences that I never expected.